John Calvin’s The Institutes of the Christian Religion presents one of the most winsome, thought-provoking, spiritually inspiring, and heart-searching summations of Christian truth ever written. Although works exist that either offer an analysis of Calvin’s views or serve as a guide to his Institutes, none fully share the aim of J. Mark Beach’s Piety’s Wisdom. 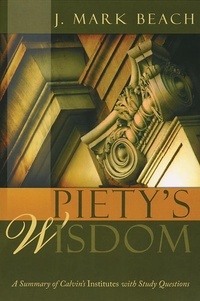 Keeping to the form, shape, and tenor of Calvin’s own work, Piety’s Wisdom offers busy pastors, seminarians, interested college students, and motivated laypersons a book that presents Calvin on his own terms. This summary can be used as an introduction to the Christian faith, as a primer for the study of Calvin, or a combination of each. While the book is suitable for individual study, the inclusion of study questions makes it an ideal tool for facilitating discussion in adult study groups.